Conferences are full of sessions where attendees know as little about each other as when they arrived at the event. In contrast, peer conferences allocate time to introduce participants to each other through a discovery process. Then then build a conference program that truly meets their wants and needs. Allocating discovery time at the start pays rich dividends over the entire remainder of the event. Investing in such beginnings enriches even a one-day event. Longer event designs allocate more time — up to half a day — to produce detailed programs that are optimized to provide the best possible conference experience for each individual participant. 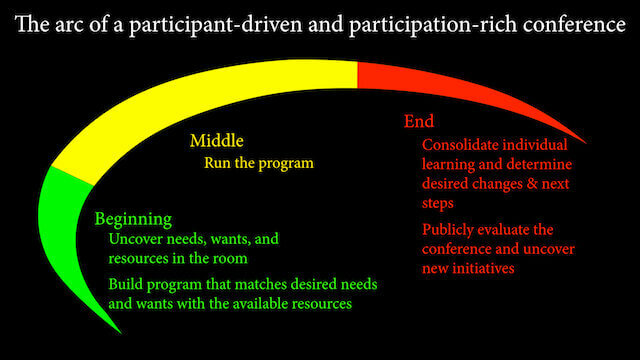 Though there are numerous ways to implement beginnings, all peer conference designs include the following. This is the piece most meetings completely ignore. And it’s the most important component of creating meetings that really work. I explain the importance and implementation of discovery in this post. Discovery exposes participants to a smorgasbord of possible conference topics, issues, and ideas. They’ve also discovered others present who are potential resources. This phase employs various methods for participants to request or offer sessions to hold in the Middle of the peer conference. Over the years I’ve found it helpful to do some topic cleanup on the suggestions and offers that participants make. This involves using a small group of conference subject-matter experts and any interested participants to cluster suggestions appropriately, combine duplicates, and carefully discard any suggestions that are clearly impracticable (e.g. too broad) or unclear. Participants now rate the cleaned up topics using one of several methods. When rating is complete we have all the information needed to build an optimum Middle for the event. The small group of subject-matter experts now uses the gathered information to decide on the sessions to run and one or more facilitators/presenters/panelists/moderators to lead them. Scheduling the resulting sessions into a conference program can now occur, taking into account any programmatic and logistical constraints. The middle of a peer conference corresponds to the program segments of traditional events, with two important improvements. First, thanks to the beginning process, the scheduled sessions genuinely reflect the wants and needs of the meeting participants. So they are almost always very well attended and appreciated. Second, the earlier scheduling process allows the scheduling group to consider the flow of sessions. This allows, for example, scheduling of general sessions before specialized drill-downs on aspects of a popular topic. Because it’s unlikely (though not impossible) that session leaders will give a carefully prepared standard presentation, sessions created via the beginning process are likely to be facilitated discussions focused around the expertise and experience of one or more leaders and incorporating additional expertise and experience of all those present. Thousands of evaluations over the years have shown that participant satisfaction with such informal facilitated formats is significantly higher than that reported for conventional lecture-style presentations. Rather than closing a conference with a banquet, keynote, or other social event, peer conferences provide two vital and important opportunities that traditional conferences omit. When you attend a conference and nothing significant changes in your life, was it worth going? You might have had fun or a rest or time hanging out somewhere nice, but was that really the point? Most attendees learn something valuable at meetings and make new connections, but often this value doesn’t translate into future useful outcomes because it isn’t reinforced in a timely fashion. The notes you made of new things to try at work get forgotten in a drawer, along with the business cards of the interesting people you met. Yes, change is hard. To increase the likelihood that conference experience translates into appropriate positive change, peer conferences provide a structured opportunity for participants to determine what they want to change in their professional or personal lives as a result of their experiences at the event. This process is called a personal introspective. During the personal introspective, attendees review their conference experience and learning and create a plan for future individual change. The last session at a peer conference, a group spective, provides the same opportunities for the entire conference community collectively. The group spective starts with a simple public group evaluation of the entire conference experience. No “smile sheet” evaluations that only conference organizers see. Instead, participants share — via a structured, facilitated process — what was great about the event and how to make it even better. The information gleaned is, of courser, immensely useful to the conference organizers, but it also does something even more important: it gives every participant a collective overview of the group’s conference experience, building a conference community around the shared experiences. The group spective also offers the possibility to create something enduring, something more than an intense, one-time experience. During the session, participants begin to explore their future together. The conference arc contains in itself everything necessary for participants to discover, learn, connect, and engage around the topics or issues that brought them together. And by its close, it has planted the seeds of future meetings built around the commonalities, learning, and connections that participants have uncovered and appreciated in each other. In this way, the conference arc perpetuates itself. This entry was posted on Monday, February 26th, 2018 at 6:14 am	and is filed under Event design. You can follow any responses to this entry through the RSS 2.0 feed.You can leave a response, or trackback from your own site.